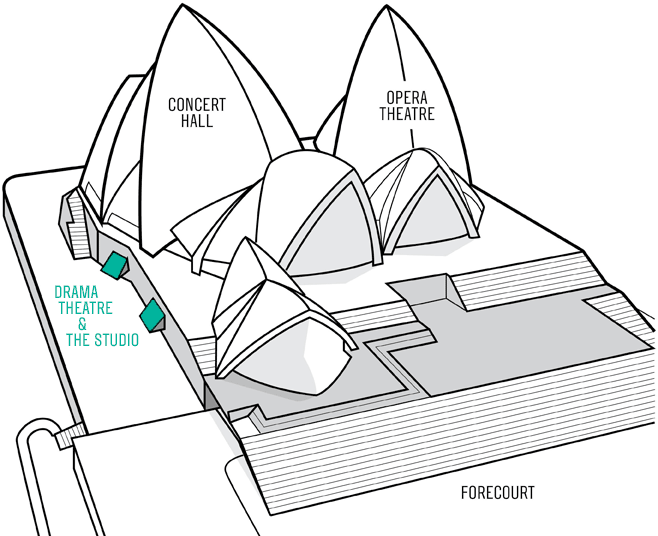 The Drama Theatre and The Studio is located on the western side of Sydney Opera House at Bennelong Point, Sydney. Circular Quay railway station, bus and ferry terminus is the closest public transport hub. There is a complimentary shuttle currently operating from Circular Quay to the Sydney Opera House. Full transport details and the shuttle service can be found on the Sydney Opera House website. The Sydney Opera House Car Park is a public car park located at the northern end of Macquarie Street, adjacent to the Sydney Opera House Forecourt. Detailed information is available on their website. The Sydney Opera House provide a range of access services. For further information on accessibility to the Drama Theatre, please visit their website. You may notice the Opera House is undertaking works to improve pedestrian access and safety at the entrance to the site and the area under the monumental steps. This work will not impact your visit. More info.